The first-annual Agnes Pelton Birthday Tea–on August 22, 2011–was hosted by Peter Palladino and Simeon Den, the new owners of Pelton’s former home in Cathedral City. Though Pelton died in 1961, her presence at the gathering was as strong as if she had just gone out for ice cubes. 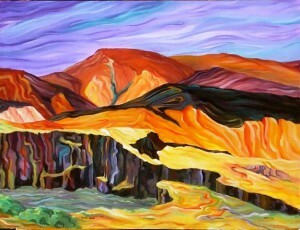 The backyard of Agnes Pelton's house with a view of Mt. San Jacinto. Photo by Christy Porter. The event marks a hometown revival for the artist. For years the city paid little notice that one of the West’s most visionary artists spent her working days here. 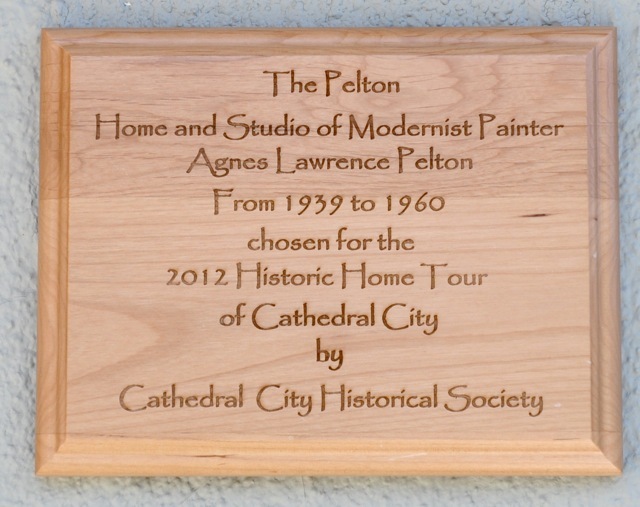 Recently there’s a growing awareness that Pelton is as important to Cathedral City as Georgia O’Keeffe to Abiquiu. The revival started with an accidental purchase. Photographers Peter Palladino and Simeon Den were looking for a second home in Cathedral City last year (they live part-time in the downtown LA arts district) when they found the duplex at 68-680 “F” street. The home was originally on “E” street before the entrance was switched to the rear of the home. The back of Pelton's house was once the front. Photo by Christy Porter. It wasn’t until after they’d cemented the deal that real estate agent Kris Rain told them they’d just purchased the former home of a great artist. Rain, too, had been unaware it was Pelton’s home when she sold the house. That’s how far Pelton had fallen out of local consciousness. 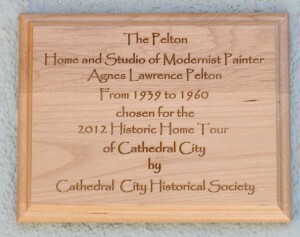 When Pelton completed her house in 1939, Cathedral City was a tiny outpost. The artist bummed rides from her neighbors (she didn’t drive) and was involved in small town life. 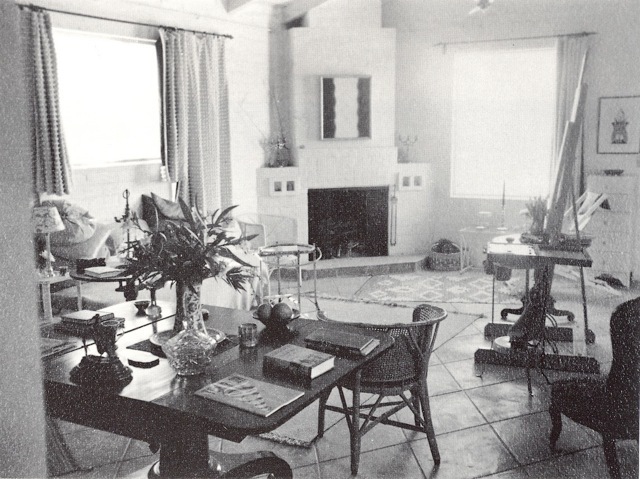 She lived in the house for 20 years, incorporating the views of Mt. San Jacinto and stars over the mountains into her most famous works. The studio where Pelton painted looked the same as she left it, with the same distinctive fireplace and diamond-scored concrete floors. 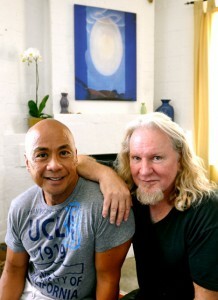 Simeon Den and Peter Palladino in front of Pelton's fireplace. Photo by Christy Porter. 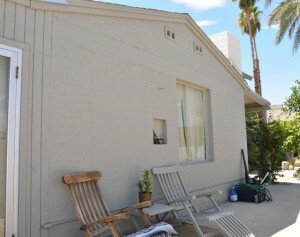 Fiercely protective of original features of the house, he instructed workers digging a pool in the backyard to avoid a remnant of an old desert willow. When they tore out the tree anyway, Palladino was so chagrined he planted a piece of the trunk and a new willow in front of the house. As close as he now feels to Pelton, Palladino is especially saddened by the fact that she had to leave her home for the last year of her life because she was broke. She moved to a smaller house in the same neighborhood. Among the guests at the birthday tea was Kris Rain, the real estate agent who sold the house, and her companion, the artist Snake Jagger. Pelton scholar Nancy Strow Sheley drove all the way from Long Beach. 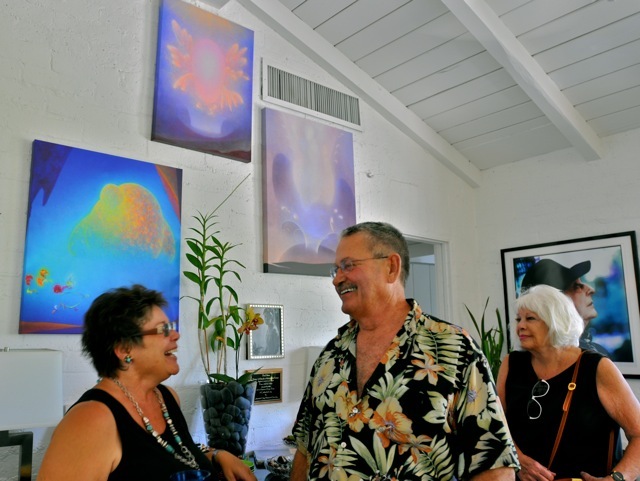 Cathedral City resident Michael Petit tentatively showed around his new desert landscape painting. Artist Nancy O’Donnell took guests–such as fellow artist Joné Dupré– to see her work in her apartment next door. (The Pelton house was turned into a duplex at some point; and Nancy rents part of it). Nancy O'Donnell, Michael Petit and Jone Dupre at the Pelton tea. O’Donnell is a desert painter herself; she had a gallery for 10 years in Wickenburg, Arizona. Since returning to the Coachella Valley, she has had a show at the Palm Desert Visitors Center and has been focusing recently on large commissioned pieces. Thanks to Pelton’s influence, she started reading about Agni Yoga (a fascination of Pelton’s) and has started meditating again. She’s even experimenting with abstractions. To that end, he’s created a Facebook page for Pelton and is working on securing historic status for the house. 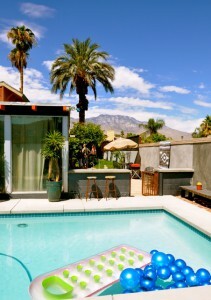 The home will be part of the Cathedral City Historic Home Tour in 2012, and Palladino is open to hosting more events honoring the genius of “F” Street. 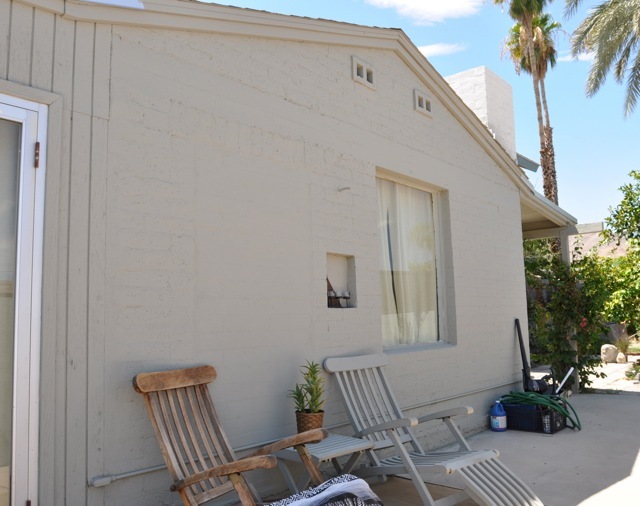 For information on the Cathedral City Historic Home Tour, call (760) 321-6577. What a great piece. You are a star, Ann. This tribute is truly wonderful! Thank you all for sharing! Thank you, Ann for introducing me to this wonderful work. You brought the artist, her work and her home to life for me; so glad to see an artist’s home preserved. The more we can promote Agnes Pelton and her work, the better. Let’s look forward to the One-Woman Show! Great article, Ann. Ann: Thank you for alerting me to such an inspiring afternoon on Jaunuary 22, 2011. The people and their labors of love that surround Agnes and her work are greatly appreciated. I am looking forward to putting a face and a hand-shake to you in person. 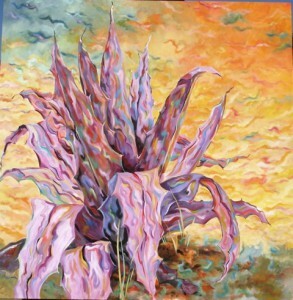 I am again inspired to continue my work about my cousin, Agnes Pelton.